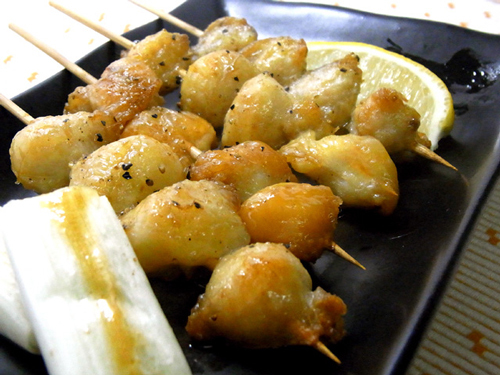 It is meat around the bone of chicken’s tail. There is a fatty, and an interesting texture. It is a menu seen well in the yakitori. But,There is a possibility of not seeing a lot in the deep-frying thing. It is suitable for the beer. Chicken has two or more names in the same part. It is called “Bonbochi” “Sankaku” “Gonbo” “Tail” etc. for Bonjiri. When it doesn’t know there are two or more names,Bonjiri and Tail ordered together, and it has been said that it will be the same dish.